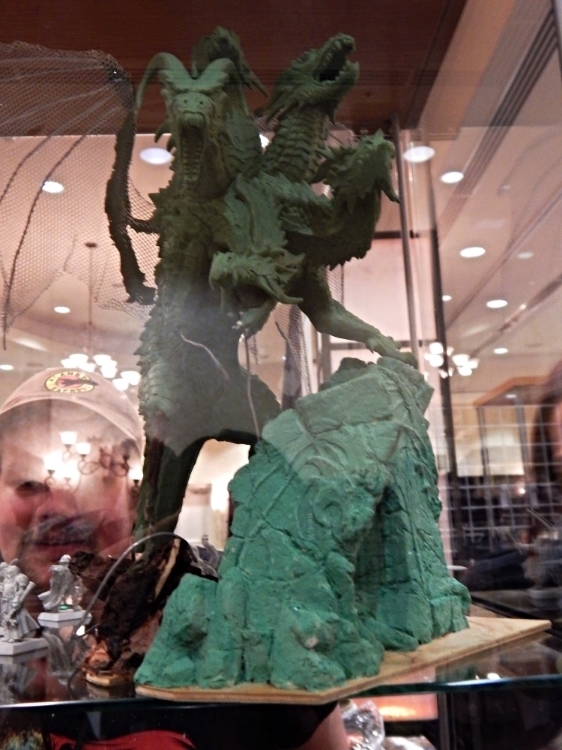 I arrived in Dallas Wednesday and attended the kick-off "Meet & Greet" at Reaper Miniatures HQ. Barbecue was served and a great time was had by all-- they even gave away free foam miniature cases left over from their most recent Kickstarter. Awesome! I met a few people I'd seen on the forums, and "Hey, you're ____? Nice to meet you in person!" when we exchanged our forum names. The night ended with me receiving my "Swag Bag" with coupons, Reaper Bucks (for Sunday's auction), free miniatures and paint, my Con badge, and many vendor samples. I arrived late on Day 1 because I stayed up until 5am catching up with family I was staying with during the convention. I'd seen them only once or twice in the last year, and I knew I'd be spending entire days at the convention only to leave late each night. However, I didn't have anything scheduled early Friday, so once I arrived around noon, I spent it visiting with Con attendees and checking out the miniatures they had brought this year. I set up my mobile painting area in the main ballroom at one of the many large, round tables with power cords underneath. Reaper does a nice job making sure people can paint at the convention, which is great since I needed to finish up half of my miniatures for the contest submission deadline on Friday afternoon! I wasn't alone either-- many people were painting in the main hall and I realized just how hard it is to talk and paint at the same time! After an hour or two of painting, I visited with a few of the artists on "Artist Row" where long tables are set up to feature the guest painters and sculptors at the convention. When they're not teaching classes, they're available for questions and you can find examples of their work displayed at the edges of the table. Reaper encourages you to talk to the artists-- they are friendly folks ready to share their knowledge! A few of the friends I made at last year's convention were asked to be guest artists teaching classes this year! Erin "Corporea" Hartwell, a super-talented painter & sculptor and overall fabulous person taught Color Theory, Creative Scenic Bases, and Flesh & Faces. Ian "Kuro Cleanbrush" Markon, who has his own YouTube channel, taught Blending & Layering, Non-Metallic Metal: Exotic Colors, and Eyes Without a Face-- a class specifically designed to painting the dreaded eyeball. It was really nice to catch up with these two since I have so much respect for them as artists as well as the fact that they're genuine, amazingly nice people! My only class Thursday was Aaron Lovejoy's "Airbrush Basics" class. This guy is a hoot! He started out the class saying "Hi, I'm Aaron and I'm weird like you". Aaron won overall "Best in Show" in this year's contest -- this guy is a badass. You can see his competition entries here (note the lighting in the pictures isn't perfect, since they had to photograph 500+ miniature entries and keep the line moving). Since I don't have any experience with airbrushes, I was eager to take this class and start with the basics. I went home fairly early that night and had dinner with family. Knowing that I had to finish up my miniatures for the contest entry deadline the next day, I was feeling the pressure. With all the personal stress of the last few months, I was woefully behind. I stayed up until 4:30am finishing my entries, and at one point, accidentally dropped one of my miniatures in bright orange paint. I suddenly burst into tears and started screaming uncontrollably "No no NO NO!!!". In that slow-motion moment, I saw over 24+ hours worth of work risk being destroyed because of my clumsiness. Thank goodness I was able to pick her up and dunk her repeatedly in my paint water to minimize the damage. Funnily enough, she was the miniature they chose in the Painters category to be judged-- and she ended up winning a Gold medal! It left little time for me to turn in my competition entries by 4pm. I was late to my second class since the 10 minute break wasn't enough to wait in line and submit in my entries. Obviously, I should have planned better-- lesson learned. After the solid block of classes, I attended the Banquet which was tons of fun! 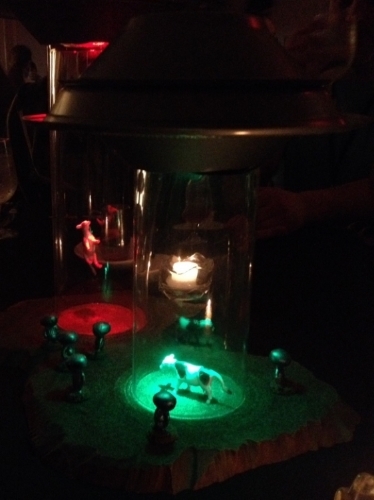 I loved the space-themed alien center pieces. Saturday started off as a much more laid-back day. With only one class, I wandered around the main hall and spent a long time looking at the amazing entries into the painting competition! (I'll list them along with the names of the fabulous painters in a future picture-heavy post). I bought some amazing Hangar 18 fabric backgrounds, which should help me take nicer pictures of my miniatures for my blog! At 4pm, I went to my "Sculpting Details for Conversions & Bases" class with Bob Ridolfi (and I'm sure at this point he thought I was stalking him) which ended up being another one of my favorite classes. After that, it was once again Banquet time! More raffles, awards where Jason Wiebe was inducted into the Hall of Fame and Aaron Lovejoy was this year's Master Series Medalist. Congrats to the both of them! One of our forum friends won a boxed set of paints, and since he already owned it, we did a Round Robin and passed it around the table each choosing a paint in turn for us to take home-- so generous! The Awards Ceremony - What can I say? It was a blur-- lots of clapping and cheering for our friends and newest acquaintances. I was happy to be a part of it and cheering for the wins of others, when all of a sudden, I had been awarded 2 Gold Medals from both the Painter and Diorama categories and a Gold Sophie Trophy for my Reaper vignette! WOW, I'm grateful and truly shocked! The amazing painters and sculptors who judged this contest gave me some great feedback after the ceremony and I was all smiles after that. I learned a lot from them and it gave me confidence and inspired to keep painting! Last year, I was awarded an Honorable Mention at ReaperCon 2014 which made me super-happy since I was still fairly new to the hobby. In turn, I started a blog to track my progress after taking lots of classes at ReaperCon 2014 to level-up my painting skills. It definitely paid off! I know it's all subjective-- one judge may love your piece, another may not, and each year is different. I kept an open mind and a humble, positive attitude, focused on being proud of everything I'd worked hard to achieve this past year regardless of if I won anything or not. While part of my brain screams "Wait, this can't be right. I'm unworthy! ", the other part is pleased-as-punch that my hard work paid off in a tangible way. I attribute any personal successes to the great teachers, friends, and mentors who shared their knowledge with me. I hope I can one day pass on that same knowledge and passion for this hobby to others. Drunken Celebrity Speed Painting - Yes, I'm listing this as an event. A spontaneous, unofficial event, for sure, but one I won't soon forget (at least the parts that I remember!) I'm not a terribly irresponsible person, but when I get wound up in the excitement, I'm like a pinball in a pinball machine. I'm everywhere wanting to talk to everyone and I'm a total spaz. I admit, I made the mistake of over-imbibing during the post-ceremony celebrations and ended up lending my obnoxious talents as heckler during Celebrity Speed Painting. Great fun was had as many of the guest artists and celebrity painters speed painted and trash-talked back and forth between two dueling tables. Shenanigans ensued as one table tried to sabotage the other with their silly antics and issued challenges-- one performed an Othello monologue while standing from atop a chair, another executed ballerina twirls onstage to win her table more time! We some sang Disney songs at the top of our lungs, and John Bonnot, the master heckler that he is, convinced me to read the first part of Chapter 8 from 50 Shades of Gray in a British accent to distract the opposing table. Yep, that happened. Ladies and gentlemen, without further ado, goofy pics of speed painting antics! Later, as most of us wound down to a considerably more responsible state, I was approached by one of the hotel employees as I chatted with James Wappel about blogs & snowstorms (I'm sure I was embarrassing myself-- I was just babbling since he's another fascinating artistic genius I admire). Evidently it was much later than I realized and I had forgotten to relay to my family that I would be out late-- so late, that they called the hotel in a panic after being worried sick. How embarrassing! "Excuse me Mr. Wappel, it's been wonderful chatting with you but my mommy called and I have to go now". Mortifying at the time, but I have to laugh at it now! It doesn't matter how old you get, there are pros & cons to staying with family during conventions. Honestly, it was my fault and I apologized to them for making them worry with my lack of communication. Lesson learned: don't be a jerk-- if you're going to save money by not booking a hotel room at the Con, make sure you call your family & return at a reasonable time! Sunday was rough. Thanks to the previous night's shenanigans (and the medicine I was taking after being sick the previous week which amplified the ill-effects of alcohol), I was hurting badly. I shuffled into Michael Proctor's "Advanced Basing" class and by the time I sat down in Derek's "NMM Special Effects" class, I fetched a cup of ice to fight the intense dizziness I was feeling. Under any other circumstances, I would have excused myself to lie down, but there was too much knowledge to be gained from these classes! After that class was the Auction, though I was unable to stay for it. I hurried to the mobile Reaper store they'd set up in the main hall to use my gift certificates to buy a few miniatures I'd been eyeing. Since I couldn't stay for the auction, I gave my 1300 ReaperBucks to Erin (aka "Corporea") telling her, "Win something AWESOME for yourself!". She didn't disappoint! I later on found out that she won a huge dragon with the pooling of a few more "forumites" and I can't wait to see what she does with it. Cheers to the Reaper forumites, who made a great showing this year! All in all, ReaperCon 2015 was amazing. I could go on, but Justin McCoy summed it up perfectly: "It's practically made of magic, and covered in awesome sauce". Word. And the best part? Anne Foerster asked me to help out in the judging room next year-- I'm so excited! So if you're attending and entering miniatures in the ReaperCon 2016 competition, chances are I'll be one of the friendly faces checking you in and logging the information for your miniatures-- hope to see you there next year!